Introduction: Gustavo Coll, who has previously written about repairs to the 1866 River Plate cable, sends this report of the laying of that cable across the River Plate between Punta Lara and Colonia in October 1866. The cable was made and laid by W.T. Henley's Telegraph Works Company. An Argentine investigator, Mr. Ariel Sar, while preparing his thesis for his Doctorate in Communications, came across the daily chronicle of the laying of the first submarine cable in South America. The report was written by M.G. Mulhall and published in the English language newspaper, The Standard and River Plate News, of Buenos Aires. Michael George Mulhall (1829-1900) was an Irish author, statistician, economist and newspaper editor. He co-founded the Buenos Aires Standard, which in 1862 became the first English-language newspaper to be published daily in South America. He co-authored the first English-language book published in that continent, The Handbook of the River Plate, a work that went to six editions, was widely consulted by immigrants and is now a historical sourcebook. Thanks to the efforts of Mr. Sar, who laboriously photographed the microfilmed pages of Mulhall’s newspaper story (found at the library of the University of San Andres) , we can have now an idea of the difficulties involved in laying this cable in the River Plate, joining Punta Lara in Argentina with Colonia in Uruguay, with a length of about 26 miles. I helped Mr. Sar in translating and deciphering (literally) some words appearing in the microfilmed pages, which in some cases were of very poor quality. Unavoidably some mistakes and omissions are noticeable. The fact that the chronicle was written in 1866 with the old/odd spelling of some words, has not been of help either. For example, you will notice the use of “Buenos Ayres” as it was the custom in those days. 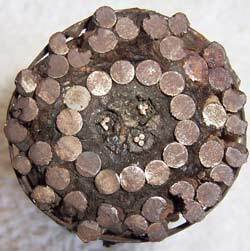 A good part of the 1866 cable remained in service until 1970, when the circuit was abandoned. Another triumph of scientific skill, another work of progress for Buenos Aires, has been achieved in the laying down of the River Plate submarine electric cable. Before entering upon the diary of the expedition, we may be permitted to premise some general remarks about the enterprise in question. The great trade between Buenos Ayres and Montevideo had long caused to be felt the want of electric communication, and about ten years ago a concession was obtained by the late M. Bertonet, which, however, was allowed to lapse. In 1864, Proudfoot and Gray, of Río Grande and Montevideo, revived the project, procured the legislative sanction and got up a private company with a capital of some 15,000 sterling. The indefatigable Baron de Maua had made sundry ineffectual efforts to get the enterprise into his hand, a significant sign of the prospects it offered. The concession by Congress gives no guarantee on the capital but simply a right of monopoly for 16 years. The Co. entrusted to the world-renowned firm of Henley of Woolwich, who proceeded to manufacture the cable, &, in two months, completed everything ready for shipment for the River Plate. 1st Day, Monday, Oct. 8th. Rendezvous on the mole-head at 7 a.m., Iron King has no steam up, she should have been alongside the Cornelia at daybreak. Weather very rough. Captain Gastaldi of the Iron King comes ashore and says he cannot start till the afternoon. Mr. Hughes fixes 4 p.m. as the hour to embark. At that hour, the weather being calmer, we are again ready, when the Veloz arrives from Colonia with Mr. Felstead and Mr. Petty, who say they were unable to lay down the buoys from H.M. gunboat Doterel, owing to rough weather. Mr. Peatty leaves by steamer for Montevideo to meet the British mail-steamer, and we have to send for Mr. John Straw to supply his place: the latter is a pilot of 44 years standing. At 7 p.m., having secured our new pilot, we are at last ready and proceed on board the Iron King, which gets under weigh for the cableship on the outer roads, but after proceeding a few hundred yards one of the pistons of the air-pump gets broken, and we are completely brought to a stand-still. Mr. Felstead goes ashore at 9 p.m. to advise the Castor of our mishap, that she may come in the morning to take is us out and tow the Cornelia down to Ensenada. It seems the cause of our disaster arises from the engineers of the vessel having been dismissed yesterday, and two Frenchmen put in their place, the latter not being quite conversant with the machinery. Mr. John Oldham, chief superintendent engineer of the Co.
Mr. Samuel J. Felstead, contractor’s cable engineer. Mr. Edwin Furze, district superintendent, Buenos Aires. Mr. George Smith, do. Montevideo. Mr. Wm. Heritage, do. Colonia. Mr. Lomax, land staff. Ensenada. Mr. James Hill, mechanical engineer. Mr. John Hughes, resident director. Mr. Talbot, electrician, Northern Railway. Lieut. Thompson, H.M.P. gunboat Doterel. Mr. Davidson, sailing master, do. Mr. James Elwess, chief engineer, do. Mr. A.F. Melntyre, 2nd do. do. Mr. John Crichton, 3rd do. do. Capt. Richard Lobb, ship Cornelia Henrietta. Mr. T. Aitcheson, chief officer do. Mr. James Blythe, 2nd do. do. With 4 cable foremen, 25 shore-men, 35 men of the Cornelia, 34 in H.M.’s gunboat Doterel, 18 on board the Castor and lighters, 10 in the Iron King—making in all 151 rank and file, beside two ladies (Mrs. Lobb and Mrs. Aitcheson). The weather has set in very fine, the engineers are in the excellent spirits, and expect to have the cable successfully laid by Wednesday evening. It will be the first submarine cable in South America, and may be regarded as an event quite as important for the River Plate as the Atlantic Cable has been for England. The total distance by telegraph from Buenos Ayres to Montevideo is 194 miles, viz: by land to Punta Lara 36, cable to Colonia 26, overland to Montevideo 132 miles. Mr. Oldham has been some fifteen years at the profession, having served in every department, both in submarine and overland lines; he was chief engineer for Henley’s land and underground contracts, and also formed part of the Atlantic Cable of 1865. The Company has evidently great confidence in him, having entrusted him with the chief direction of affairs and permanent management of the enterprise. Mr. Felstead has seen much and varied service in submarine telegraphs, viz: the first Atlantic Cable of 1858, the Malta and Alexandria line, the Algiers and Toulon, the Sicily and Malta, the Corfu and Ancona, the Red Sea, the Persian Gulf, &c., besides two in Sweden, three in France, and other minor ones. He is superintendent in Government contracts for the great house of Sir Charles Bright and Latimer Clark, having got six months leave of absence for the present enterprise. Mr. Furze, who has also had much general experience in electrical branches of the services, and contributed largely to the leading scientific journals of the day, was commissioned by the engineers to remain in England during the construction of the cable, and see that is was made according to specification. He now assumes the post of district superintendent for Buenos Ayres. Mr. Heritage served as assistant superintendent of the Scotia district of the International Electric Telegraph Co. and as seen much hard service in the Banda Oriental during the construction of the line to Colonia. On the conclusion of the line, he will remain in the very responsible charge of the cable and land at Colonia. Mr. G. Smith was Manager of the United Kingdom Telegraph Office Newcastle—an important station involving high trust—he is one of the most expert readers of the day, and can decipher by sound any message, of whatever length, faster than any clerk in Buenos Ayres: he will be chief at Montevideo. Mr. Vick has a good practical knowledge both of land and submarine lines; he has seen much foreign service, especially Barcelona and Majorca, Brindisi and Sicilian, Swedish and Norwegian, and the Atlantic shore-end in 1865, under Mr. Oldham. He is a good linguist and well suited for the post of inspector. Mr. Lomax is a young man of much energy and attention, and has given every satisfaction in charge of the land staff, now employed at Ensenada. Mr. Hill is a first-class practical mechanical engineer, and has served before on numerous cable expeditions, being one of Mr. Henley’s permanent staff in Woolwich. The cable foremen are all of great experience, having served under Mr. Felstead for several years, in various countries. Our diary of the first day end here—in the roadstead in Buenos Ayres—with the city and its thousand lights seen in the distance. We have been retarded a day by the unforeseen casualties mentioned above, but it seems the inevitable fate of all great enterprises to meet with obstacles at the outset, and although ours may not yet he wholly overcome, we shall start at daybreak for Ensenada to commence operations, and trust that Heaven will aid the efforts of well-directed skill to carry out this glorious undertaking. 2nd Day, Tuesday, Oct. 9th. At 6 a.m. the Castor is seen preparing to leave port, and soon after steers out with the launches in tow: leaving the launches near the Boca light, she comes around to us. Captain Davis boards us and declares his steamer cannot tow both the Cornelia and the launches: it is arranged that the Cornelia must wait till the Iron King be repaired, probably a work of seven or eight hours, and the Castor shall at once start for Punta Lara, leave the launches there, and cross over to Colonia. Capt. Gastaldi went ashore at sunrise with the broken piston. Messrs. Hughes and Coghlan return ashore. Messrs Felstead and Smith come with us in the Castor: we start at 8 a.m., pick up the launches and bend our course towards Ensenada. It is a lovely morning and high tide: we soon pass the coast stretches away in a long line S.W. The Castor is a tiny little steamboat with stern-wheel, and it is a wonder how she ever made the passage out from England. The launches were built for Barón Mauá, in this country, each about 70 tons burthen, with plates on the sides, and seem very suitable for the business in hand. By noon we arrive on Point Lara, and moor the launches, leaving four men in them. At 1 p.m. start for Colonia. Mr. Felstead gives me some interesting particulars about telegraph cables. The first inventor was Dr. O’Shaughnessy of Calcutta, who passed a wire across the Hooghly; the first cable of importance was that put down by Mr. Brett in 1851 between Dover and Calais: at present there are some 40 cables working in different parts of the globe, in the aggregate about 20,000 miles. At 3.40 we reach Colonia and anchor near the Doterel: a boat from the latter comes alongside to say that she will be ready at any hour in the morning to set out with the buoys. We land, and dine at the Fonda. After dinner we visit the Cable-house on the beach. The place hereabout is full of sharp rocks, but, we find higher up a fine sandy beach. The town is mostly composed of massive stone walls and houses in ruins, for it is only a remnant of the Colonia of the last century, when English slavers traded here with the Portuguese. During the wars of Oribe it suffered heavily and old Mr. Kelly informs us he twice saw the plaza run with blood. The light-house is very fine: the church is the only public edifice. We are to be ready before daybreak to-morrow to go aboard the Doterel. 3rd Day, Wednesday, Oct. 10. 4.30 a.m. Blowing hard: Doterel’s boat waiting for us at the wharf. The day looks murky, but we push off, call at the Castor and send her on to Punta Lara. Jumping aboard the gunboat we are kindly received by Lieut. Thompson, who weighs anchor at 6.40. We have 3 buoys to lay down; each weighs about 3 cwt., besides a mushroom of 56 lb: they are made of sheet-iron, about 5 feet in diameter and onion-shaped, carrying a red flag on a 10-foot pole. Breakfast with the captain at 8 o’clock. Man from masthead sings out “land ahead”. Our course is S.S.W. Mr. Straw taking soundings. Day clearing up fine. At 4 minutes past 9, we launch the first buoy, being now 10 miles from shore, in 4 fathoms of water. The buoy is slipped out with the greatest ease and elegance, riding from its moorings with its flag gaily kissing the morning breeze: we leave it behind and continue our course. Meantime the gunners-mate and the corporal of the marines call up their men for drill; the first put his boys through the single-stick exercise; the corporal drills his men with the Enfield rifle, while others are cleaning the ponderous Armstrong guns. The vessel exercised her guns yesterday in front of Colonia: one is an Armstrong 110-pounder, another 40 pounder, and two brass 24-pounders smooth-bore. Everything on board is in apple-pie order, and officers and men are a worthy sample of the British navy. At 56 minutes past 9, having gone 4 miles, we drop 2nd. buoy in 6 fathoms of water, at 14 miles from Colonia, or nearly in the middle of the river. We can now descry the Cornelia Henrietta towed by the Iron King in the direction of Punta Lara, the former flying the Montevidean flag from her fore-peak, the signal agreed on the Castor is also in sight. At 11 minutes past 11, we drop the 3rd buoy, 4 miles from the last, in 4 fathoms of water, with Mr. Bell’s house at Punta Lara bearing S.S.W. about 6 miles off, making the distance 24 miles across from land to land. The 3 buoys are in a straight line, as the crow flies. In 20 minutes we come up with the cable-ship anchor, 4 miles from shore in 18 feet of water. The Cornelia was an old Dutch East-Indiaman, and her lofty masts and solid timbers give her an imposing appearance: she has been much strained by the cable, a dead-weight of 500 tons amidships, and her deck shows a decline of several inches. She ran much risk in crossing the Atlantic, and met very bad weather off Rio, when she asked a Brazilian vessel to stand by her, but the other cleared out in the night, suspecting her for a corsair. Capt. Lobb is a experienced seaman and efficient commander, ably seconded by Mr. Aicheson and a crew of 25 men. We find on board Messrs. Hughes, Coghlan, Talbot &c. The Iron King was repaired by 4 p.m. yesterday and towed the Cornelia last night to within a couple of miles from here, coming up this morning to take her position at this place. The cable-ship draws nearly 18 feet of water. The Castor had to supply the Iron King this morning with coals. The cable is neatly coiled in an iron tank 30 feet in diameter by 10 in depth, in 53 coils of ½ a mile each, being 26½ miles long and weighing 413 tons, all in one piece. It is the heaviest cable ever made, being in proportion 8 times as heavy and 11 times as strong as the present Atlantic cable. The tank held also 80 tons of water to keep the cable cool, but it is now dry, and we can see the skill of Mr. Henley’s men even in the manner in which to cable is coiled. The paying-out and picking-up gear is a wonder of its kind, and was specially manufactured for the purpose, the shaft being 7¼ inches diameter, and larger than that used for the big cable in the Great Eastern: it is a triple apparatus, can pay out the cable at one, two, or four miles per hour, is furnished with a patent indicator, and weighs over 5 tons. The centrifugal pump can throw out 4,000 gallons a minute, and it is certain that on the occasion when the vessel sprung a leak, it was this which saved her. Mr. Furze invites us to the testing-room, where he displays his marvels of electricity: the batteries, gutta percha tubes, and scientific apparatus defy our power of description. Suffice it to say that the most improved pieces of electric mechanism are here, including those used in the Great Eastern in laying the ocean cable: the Galvanometer is the most delicate instrument ever invented, the needle varying at the mere touch of your finger on the outer mahogany case: it is no less minute than sensitive, shows a power in resistance of 1 in 350 millions. The Morse instrument is almost as wonderful, writing its message on a tape of paper: it communicates with 50 battery-cells, which number may be increased to 200 for the purposes of testing. The apparatus can be worked with ease at the rate of 30 word a minute. The Castor returns from the shore, having gone with Mr. Coghlan to measure the distance: they kept the land-log running all the way in, Mr. C. makes it exactly 4 miles. There is a bar a few hundred yards ahead of the ship, and beyond that deep water. It is resolved to pay away 4½ miles of cable into the launches, and land the shore and tomorrow. Capt. Thompson send a dozen men from the Doterel to aid us, and the Castor has brought 25 shore men. At. 2 o’clock the men are all ready, and Felstead gives the word: the ponderous windlass commences to revolve, and cable moves up like a thing of life from the hold where it has so long lain, traces its course along the deck, descends from our stern, is caught by the Doterel men, and slowly but steadily placed in oval coils in the bottom of the lighter. The work now goes on smoothly, and we watch with admiration the first step towards laying the cable. Sixty men aid in paying it out, and at 3.25, one mile is already deposited in the first launch. The machinery works admirably; so do the men, and the cable runs down without a flaw or twist. We have now to pay it into the second launch, the first taking 14 miles so as to go near inshore, and the second to carry 3 miles. This occasions some delay: at 7 o’clock we stop for the day, the men being tired and hungry, cable paid out, about 24 miles. It was proposed to try and take the ship nearer shore, but the captain going to take soundings in the Castor finds only 17 feet of water on the bar, and wisely resolves not to attempt it. We celebrate the happy commencement of the work with a festive evening, and toast “Success to the cable” in a bumper of champagne, then turn in early, for a long day’s work tomorrow. Five a.m. The Doterel’s men come aboard; Mr. Hill gets his machinery again under weigh, and at 5.50 we resume the paying out of the cable. The work continues briskly at seven revolutions per minute, each revolution giving six yards of cable: at seven o’clock we have three and a quarter miles, and at 9:15 the shore end is all lodged in the launches. The Castor comes alongside; the engineers and captains agree on their programme of operations: the ropes and hawsers are duly settled; the launches are attached to the stern of the Castor. At 10:30 we embark in the latter steamer. The hearts of all beat high with anxious hope, and it is a moment of joyful suspense. The morning sun shines gladly upon us, and the little flotilla here assembled, off the Santiago bank, look with longing eyes to the placid shores of Ensenada, from which we can see the flag staff flying its signal. Capt. Davis gets on the bridge, with Mr. Gore steering; Mr. Coghlan takes command in the first launch, and Mr. Felstead in the second. The Iron King is ordered to go ahead of us and keep near in case she be wanted. The officers of Dotorel wave their caps as the clear commanding voice of Mr Felstead calls out “ahead slow”, and the cable begins at ten minutes past eleven to pay out from the stern of the second launch. A cheer from the Cornelia, and the bunting is run up to salute the auspicious moment: she flies the Oriental flag from the fore main, the Henley Telegraph flag from the main, the Argentine from the mizen, and the British ensign from the mizen-peak. At this moment we see the Italian war steamer Ercole pass close to our third buoy, en route for Montevideo: she will wonder to see so many vessels in this out-of-the way place, with bunting and full of people. The expedition not being generally known, the Ercole will suppose we are loading horses for the seat of war. Our mission is a nobler and more pacific one. We advance steadily for the shore, steering S.W. half W., the flag-staff bearing S.S.W., and the current running three knots. All goes well, without stoppage, but a “kink” occurred about seventy yards after starting, from the men being as yet inexpert in turning out the end of the coil: it does not affect the insulation of the cable, but will have to be taken up and spliced. We cannot now stop, as much of the cable would be lost, but push on steadily towards Point Lara. At 12.40 we have paid out three and half miles, and stop about 500 yards from the shore; the Iron King coming to anchor in two fathoms of water about a mile from land. Commander Thompson send his boat to take soundings up to seven feet, this being then draught of the Castor, and we get in within a couple of hundred yards. We can see a horseman on the shore, and a woman near the door of the house at Punta Lara. A boat with an anchor for kedge is sent very close to land: we get into the Doterel’s boat, while the Castor casts anchor, and as the water becomes shallow we pull off our boots and wade ashore at 2.30. The Telegraph encampment is situated in a clump of brushwood, under the shade of some venerable ombú trees, just above the beach, which is sandy and covered with “conchilla”. We are about two leagues from Ensenada, and can see the scattered white houses near the green line of coast terminating in the peach mount of Point Santiago. Mr. Heritage and his men have four tents, with few comforts, but a host of scientific implements, a few dogs act as sentries: some quarters of mutton are hung from the branches of an ombú, boxes and pickaxes lie about, and the whole place has a gypsy appearance. A dozen telegraph posts have been put up, and the line will run almost straight hence to the city. One of Mr. Bell’s peones has come to lend two horses, it is unfortunate he has brought us not twenty; Mr. Hughes prevails on him, after much difficulty, to sell us a bullock, as we have 150 people to feed. The Castor steams out for the ship: it seems some tools have been left behind on board. At 3 o’clock the launch having pulled with the kedge close in to shore, a line is passed ashore to measure the exact distance, which Mr. Coghlan reports thus: from the launch to the beach 505 feet, from the beach to the first telegraph pole, 900 feet. On the return of the Castor the men having paid into the second launch over half a mile of extra cable, Mr. Felstead cuts it off at the given measurement of 1,405 feet. At. 4:15 the hawser is thrown out and the men carry it ashore. Then 5 horses are yoked to it, and all hands get into the water, for the arduous task of landing the cable. It is an exciting scene, and one never to be forgotten. All hands, including Messrs. Hughes, Oldham, Coghlan, Felstead, and more than 50 men, pull away with a will: it is a hard pull, and a pull together, and at 4:35 the end of the cable touches the dry land. We have still over 300 yards to go, and the weight of the cable renders it indeed a hard labor. The men had to wade backward and forward through the water, pulling it in bights, then again in a semicircle. I never before saw men work so gallantly, perseveringly, and zealously. The poor horses almost break their backs trying to pull the tremendous weight. The men are growing weak with toil and hunger, but never give up. Every two minutes they give a fresh pull and gain some 20 feet of distance. It is resolved to land the cable tonight, and, though a storm is coming up from the S.W., we must finish the work. For two hours the poor fellows have been toiling away; the rain begins to fall, accompanied with thunder and lightning: they are heedless of the storm and of naught but the cable. Up the sandy beach and over the “conchilla” beds, they tug and strive; the Dotorel men, the sailors of the Cornelia, the shore men, and all; Englishmen and Italians work with equal energy, and at sunset the task is nigh accomplished. This done! the cable has now been connected with the land-battery, and a joyous salute is sent to the ship and instantly responded to by Mr. Talbot. Cheers of honest exultation rend the air, and the wearied workmen throw up their caps for joy—Hurrah for the cable!” Where are the local authorities, the magnates of Buenos Ayres, the natives of the country? Alas! there is but a single “gaucho” spectator, who understands little of the cause of the commotion, and neither men nor horses have been provided by the neighbors to render timely assistance. No matter; we have the greater glory, and the hardest part of the immersion of the cable successfully accomplished. Captain Lobb and his chief officer receive a message from Mrs. Lobb and Mrs. Aicheson—“hope you are well”, and answer “we are wet through; get dinner ready”. The Iron King takes off Messrs. Hughes and Coghlan, and the rest embark in the Castor. Much delay is caused in taking off the launches, and it is near 9 o’clock before we start for the ship. The storm is passing off east, but the tide is high, and the steamer rolls horribly. 10 p.m. We cast anchor a couple of hundred yards from the ship, the sea is rolling in huge billows, and I have every fear of being swamped, but Capt. Lobb engages to reach his vessel safely, and with a slight palpitation of heart and a cautious jump into the boats, I venture with him. The ground-swell is enough to frighten anyone but a seaman; we come near the ship, but it now seems impossible to reach her. The vigorous stroke of 4 oars brings us not an inch nearer, and we are tossed like a cork on the water. I hardly know how we have at last reached the gangway; but a good dinner is waiting for us, and we are all very hungry. After dinner we have a few songs, and while passing the jovial glass, the captain is suddenly called on deck. 1.a.m. We are in a fearful gale of wind, the vessel creaks in every joint and timber, the pilots are contending about what to do, the ship has dragged her anchor some 200 yards, the second anchor is let go, we are driving down fast on the Doterel. Things are in a bad way and the vessel cannot swing, being held by the cable: the cable is slackened, but the storm continues. 1.30 The night is dark and the sea wild: no one ventures down to sleep, for the vessel is old and unseaworthy, and we are close to the bank. She has not dragged the second anchor. 2 a.m. The wind abates. We have our head to the storm. We lie down to sleep on the sofas. 4 a.m. The gale worse than before, but happily we are asleep and know nothing of it till morning: the Castor under steam all night, and narrowly escapes collision with us. Our vessel is not aground, but bumps on the sandbank at intervals. The Dotorel is also under steam, and preparing to give us a wide berth if necessary. The Iron King is also on the alert; the captain was asleep when the gale began, but is now ready to weigh anchor and move off. 4.30 a.m. The gale abates. The vessels have ridden it out safely. At sunrise we have telegrams from the shore, enquiring how we passed the night. It blew a hurricane on shore. The weather is still very wild, and we shall hardly be able to do anything today. 10 a.m. We send a telegram ashore to be conveyed by “chasque” to the city for the Standard announcing how things stand. The contract of the Iron King expires this afternoon at sunset; if she leaves us we shall be in a great dilemma. 10.30. The Doterel enquires “Is the cable all right?” We answer “Yes”. Exchange several messages with the shore. The “chasque” has left for the city. We have been aground since morning on a soft bank, in 14 feet of water, the tide having receded. 11.15. We signal for the Castor to go in and fetch the launches, but she will not venture, it is so rough. 1 p.m. The weather has calmed down very much; the water is rising, and we expect soon to get afloat. The insulation of the cable continues complete. Q, What are you doing on shore? A. The men are working at the trenches, burying the cable. 2 p.m. Lieut. Thompson comes on board, and offers any assistance in his power. He sends a message ashore “Is there much sea on the beach, and can the shoremen get aboard the lighters to come off?” Answer: “There was much sea this morning, but very little now; the men can embark”. 3 p.m. The Castor and Iron King weigh anchor for the shore, to bring off the lighters and shoremen. We telegraph, “Put 16 men in the launches, the steamers are going in for them”. 5 p.m. We are almost afloat, in 17 feet of water. The Iron King is coming off with the men, but the Castor remains near shore with the launches. It is arranged that we shall try to get out to the first buoy to night; the Doterel will lead the way, shewing two white lights at the peak, and in case she cannot find the buoy she is to lower the lights, and lay to till we come up. 6 p.m. Mr. Lomax and his men come on board, and the Iron King takes our hawser to pull us afloat. The paying-gear is got ready to ease the cable. 7 p.m. We get afloat, and begin to pay out the cable; but the Iron King pulls us out of our course, owing to having taken only one hawser instead of two. It is growing very dark. The signals of lights are: white, all right; blue, go slow; red, stop her. We have not gone a mile and a half when we find the Iron King unmanageable, the signals not understood, and we have to stop for the night here. Captain Gastaldi comes aboard and arranges with Mr. Hughes to remain with the Iron King till 8 a.m. to morrow. If it be fine weather he will lash the steamer alongside, and then we shall go on quickly. We give him beef for his vessel. Captain Davis will come up in the morning, by daybreak, with the lighters. The weather promises to be fine, the glass is rising: the moon looks clear. The gunboat has found the buoy, and keeps her two lights at the peak. 4.45. Captain Gastaldi comes aboard and refuses to take us in tow unless Mr. Hughes give him a note for L100, which the latter does, on condition of extending the time from 8 o’clock till 10 a.m.
5.22. The Iron King takes us in tow with two hawsers, and we pay out the cable at the rate of 3¾ miles and hour. The Castor is coming up with the launches. The gunboat is ahead. 5.51. Passed the first buoy, 5½ miles of the cable immersed. The Iron King cannot steer fair; we are making a very zig-zag course. Captain Lobb and Mr. Felstead shout themselves hoarse, but all to no purpose; the captain and pilot of the Iron King seem neither to understand us nor themselves. Our men grow impatient, as these turns cause a loss of much cable. The Castor rolling so dreadfully, we at last succeed in throwing her a tow-rope, and get on better. 7 a.m. The Iron King continues to give much trouble: it is supposed she has not full steam on, as she has little command over the ship. 8:15. Passed the 2nd buoy, 9½ miles of cable paid out. The insulation continues perfect, and we exchanged messages with the shore. The Iron King becomes so unmanageable that Mr. Hughes sends for the captain and requests him to lash the tug alongside our vessel. We get the Castor on our starboard, and the Iron King on our port side, and go on well for some time, but the first gets a hole knocked in her side with her own anchor, and the second has a boat considerably bruised by such close contact; and they again loosen the ropes and take us in tow as before. 9:20. We are still getting on so irregularly that the gunboat comes up to lend a hand, and throws a tow-rope to the Iron King, but after 20 minutes it is found the gunboat is unequal to the task, and Lieutenant Thompson reluctantly abandons the attempt, hoists his sails and makes towards Colonia. 10:25. The captain of the Iron King comes aboard to say that he must positively leave us, as Messrs Lanus are under a penalty of L10,000 per diem for supplying the army, and three vessels with provisions are waiting at Buenos Ayres to be towed to the seat of war. We all remonstrate with him on the danger he will expose us to by leaving us in the middle of the river, and after much persuasion of Mr. Hughes prevails on him to remain with us all this day, for L100 more, i.e. L200 per day, giving him a certificate that he has earned the first L100 up to 10 a.m. This is a most fortunate arrangement, as we are in sight of Colonia and have only about 10 miles to go. Mr. Hughes feared he should be obliged to go to Buenos Ayres in quest of another steamer. 11.25. We have been knocking about for half an hour near the third buoy, and wasted half a mile of cable: up to this we had not lost 300 yards in the whole distance from Punta Lara. The Iron King goes half a dozen different ways in as many minutes. Mr. Felstead and the others are quite enraged. We send our chief officer, Mr. Aicheson, on board the Iron King, where he finds everything in confusion: the pilot thinks our pilot wrong, the French engineers cannot understand Captain Gastaldi, and the latter complains that no one will attend to his orders. We signal to the Doterel, which is some miles off, “can you fetch the lighters?” and she replies, “I’ll try”, at the same time shifting her position and steering towards the buoy near Punta Lara. 12 o’clock. The wind is favorable and we clap on sail, with the steamers lashed on either side. Now we go ahead gallantly, and gradually the coast line of the Banda Oriental rises on the horizon. The cable runs out astern in first-rate style, and we exchange messages with the shore; the messenger sent to B. Ayres has not yet returned. Nearer and nearer we approach the wished-for coast, and can see the light-house of Colonia gaily hung with flags to bid us welcome. 3 p.m. We are aground on the Fisher’s Bank, but the flow of the tide before sundown will float us off. The charts are brought out and the bearings taken; we are 4 points out of the direct course, having Colonia N.W. ½ W., Farallon Island N.W by W. Point Santiago almost due S., and Point Lara S.S.W. : we are 6½ miles from Colonia, and have still on board 9 miles of cable; depth of water 17 feet , our ship drawing 2 inches more. Our pilot, Mr. Gore, goes in the Castor to take soundings, and finds the same water for 2 miles, after which it gradually deepens to 24 feet, nearer shore. The Doterel is in sight returning with the lighters. 4 p.m. The tide having risen, we are almost afloat, and the steamers pull us off through the mud. We are again going ahead, the steamers pull well together, the weather is most favorable, and we stand in groups on deck watching the final of the great enterprise now happily being brought to a close: the cable pays out at the rate of 4½ miles an hour. The light-house at Colonia is decorated with the flags of all nations, and our ship is also covered with bunting. So saying, the gallant Frenchman steams around our bows and continues his course at full speed. The incident has caused quite a stir on board,and everyone is full of admiration for the courtesy and kindly sympathy so displayed. 7 p.m. The Doterel leaves the lighters to anchor a mile astern, and passes us. We are now but 1¾ miles from Colonia, and cast anchor. We telegraph to Point Lara, “has the messenger arrived from B. Ayres?”; answer: “not yet”. The commander of the Dotorel comes aboard and offers his men to assist in laying the shore end to morrow. The Iron King leaves for Buenos Ayres, taking a letter for the Standard. 8 p.m. Working the pumps: the men, although nearly tired out, work away with a will, as they sing some of their sea-songs “Whiskey Johnny”, “Bound to Rio Grande”, “Paddy works on a railway”, & in which a colored man named Ben leads the chorus admirably. The leak is pumped dry, the day’s work is done, and the cable-men and sailors come aft on the quarter deck to us with some music and dancing: jigs and hornpipes are performed, the fiddler being a cable-man who had served in the Great Eastern, and who is a capital musician. But the most amusing of all is “Dancing Tom” also of Great Eastern celebrity: this is a kind of elastic doll made to dance to the fiddle, on a short board, by pulsations of the finger with such precision and drollery of effect as to convulse the spectators with laughter. Simple as the performance may seem, it has required years of practice, and was a favorite amusement on the Great Eastern. Tomorrow we shall land the shore end: the weather is most propitious. It is deep water close up to the shore and the lighter can go within 20 feet of land. 6 a.m. The Castor brings up the launches, one of the which contains ½ a mile of cable cut off from the shore-end at Point Lara, and the other is to receive the shore-end to be laid here. We communicate with Mr. Smith at Point Lara; the messenger has not yet returned from Buenos Ayres. Twelve men have arrived from Doterel, Mr. Hill gets his machinery under weigh, a bight is made over our stern, and the cable is gradually paid out into de launch. Meantime the Castor goes in to shore to measure the distance from the ship. 7:30 a.m. After breakfast we are suddenly brought to a stand-still, our machinery stopping short. Mr. Hill reports 9 tubes of the boiler to be leaking, and Lieut. Thompson directs him to go aboard the gunboat to get others. Much delay is caused by having to wait till the tubes cool. Meantime 16 Italians of the shore-gang are put to haul out the cable, but it is very slow work. This unlucky accident prevents all hope of our returning to Buenos Ayres this evening. 8:45. The Castor returns; the logline shows the distance to shore to be 3,200 yards. The men continue very slowly turning the cable into the launch; it will take us all day. 10 o’clock. A whaleboat is coming off with several of the town-folk. Colonia is dressed out with flags, and joy-bells are ringing. The whaleboat comes alongside with the Gefe and a dozen of the leading men, including Mr. Murtagh, the Standard agent. Mutual congratulations are spoken, and our visitors proceed to examine the cable and the testing room; they send a message to Point Lara, enquiring how is Mr. Smith and if he finds many pretty girls there? Smith replies: “None so handsome as the Colonia girls!”. 11.45. The boiler is partly repaired, and the paying-out machine works a little faster. Captain Lobb invites the Gefe and his friends to luncheon and they toast “success to the cable”, with all honors. 1.15 p.m. The indicator shows that 3,400 yards of cable have been paid out into the lighters, and Mr. Felstead proceeds to cut it off: this is done with an axe-saw, the operation taking about five minutes. The ship is no longer in communication with Point Lara: the balance of cable remaining in the hold amounts to two miles. The ship is now all on one side. 4.30. The Castor attaches a towrope to the launch. Lieut Thompson sends a boat to take soundings in shore. We embark in the Castor, full of joyful satisfaction at the approaching completion of our labors. The beach is lined with people. 5.30. After sundry delays the signal is given, Captain Davis sings out “slow turn ahead”, but the cable holds the lighter back and the towrope snaps across. At last we get fairly under weigh, and every movement of the lighter is watched with breathless anxiety, as the cable is paid out astern, Mr. Felstead directing operations. We make for the shore in a straight line, Mr. Gore steering. 6.20. We are within hail of the shore, the joy-bells ring out a welcome, and hundreds of people are gathered on the rocks to witness the greats event. Mr. Felstead calls out “stop her”, and it is feared the cable will not reach the shore. Lieut. Thompson takes a line in this boat and measures to the water’s edge: the distance is 560 feet, and we have only 480 feet in the launch. This is a serious disappointment, tho no injury to the cable, and Mr. Hughes is rather annoyed at the occurrence, which will delay us another day. It is but a fresh link to the chain of adverse circumstances with which we have had to contend from the outset. The occurrence is, however, a common one: even Sir Charles Bright, last year, in laying a cable of 55 mile in the Baltic cut it too short and had to splice at both ends. 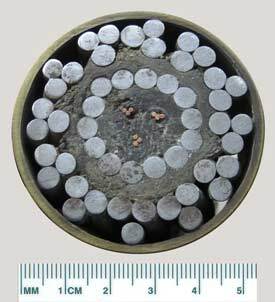 The work of splicing, although delicate, involves no risk: in fact most deep sea cables have to be spliced at the shore-end, and no splice has ever yet been known to open. 7:15. It is resolved to leave the launch where she is, and cast anchor for the night, while we return to the ship and set the cable men at work preparing the composition of the joints, so as to be ready to make the splice tomorrow morning. 9.30. The cable men get their tools and materials, including naphtha and gutta-percha, and we start again in the Castor towards shore: we tranship then to the launch, where they will have some three hours work making the gutta-percha joints, which must then be left seven hours to soak in water. 10.30. After knocking about for some time among the rocks, expecting to stave in the bottom of the boat, which got some very hard bumps, we succeed in getting safely ashore, and seek our way by moonlight through the ruined streets to the hotel, where we luckily find quarters for the night. Ten a.m. Go on board the launch. The joints having been duly soaked the men set about the work of splicing. Mr. Furze has brought his batteries from the ship for testing the cable when completed. The Cornelia and Doterel have all their bunting displaying, and this is a gala-day both afloat and ashore. The inhabitants turn out in holiday attire, and the light-house is hung with flags. The Gefe has promised to send six oxen to help the cable ashore. Eleven a.m. The splicing is a very interesting process. The outer strands of wire are uncoiled, then the inner ones are also opened, and the gutta-percha tubes cut. 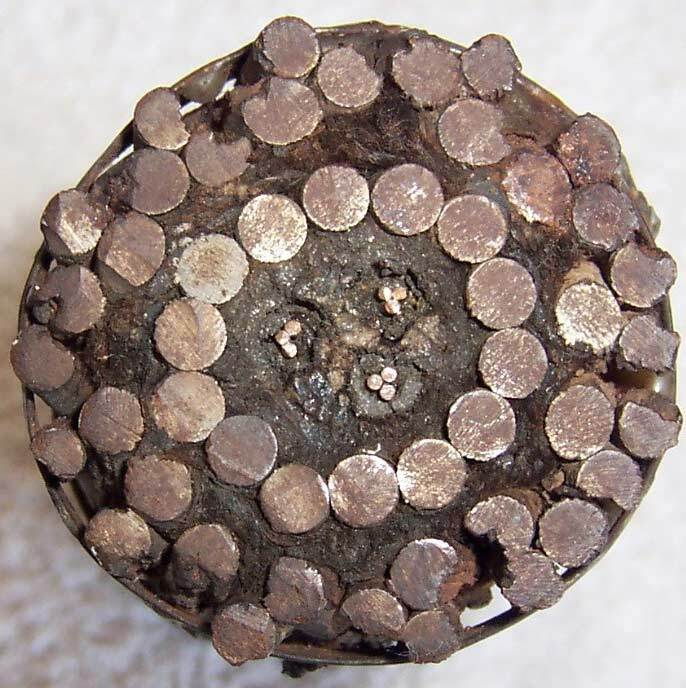 Each of the conducting wires of copper is scarfed and rolled round with fine wire, but all the joints are three inches apart and covered with gutta-percha: then the first roll of galvanized wire is wound around, and lastly the outer strands tied with thin wire and compressed with a tongs: this last is termed the cable armor. The cable men did their work cleverly, and were ably assisted by the sailors of the Doterel. This occupied nearly three hours, all which time the town-folk remained on the beach, notwithstanding the scorching heat of the day. 2.30 p.m. The splice is finished and Mr. Felstead sends a boat ashore with a rope to haul in the cable. Some of the sailors get a ducking in this operation. Fifty men under Mr. Vick lay hold of the hawser and pull the launch to within ten yards of the shore. The joy-bells are rung and a hearty cheer is given by spectators. 3.13. The cable touches the shore. Hurra! The feat is accomplished. The first telegraph cable in South America is happily laid between the opposite shores of the River Plate. Our difficulties are at last over, and everyone concerned feels an honest exultation in the success. The oxen are found unmanageable, but the citizens lend a hand and the cable is triumphantly carried up the beach to the telegraph-house. Then the workmen wave their caps in the air, and three English cheers send the glad tidings to the ships in the offing. 4 o’clock. Mr. Furze attaches his battery to the end of the cable for the purpose of testing, and we look on in breathless suspense. He sends the news to Point Lara, and the responding-wire instantly gives signal that the message has arrived. But Mr. Smith is away, and we must wait till the assistant calls him. 4.10. Mr. Smith replies “All right”. Mr. Oldham telegraphs “Here Colonia”; answer “Who are you?”, to which the former replies “the chief-engineer”. It is impossible to convey an idea of the intense interest and breathless attention with which we all witness this first proof of the success of the enterprise and perfect insulation of the cable. The following message is at once sent to Vice Presidente Paz and Governor Alsina, to be transmitted by “chasque” from Ensenada. Colonia, B. Oriental, Monday, Oct. 15, at 15 minutes past 4 p.m. It is with the utmost joy that we beg to salute Your Excellency and inform you of the happy completion of the laying of the electric submarine cable, between this city and Point Lara, which was effected at 5 minutes past four today. On so auspicious an occasion we offer our most heartfelt wishes for the prosperity of the countries so united, and congratulate your Excellency on the realization of so important an enterprise during your term of office. 4.30. We embark in the Doterel for Buenos Ayres (Messrs. Hughes, Coghlan and Mulhall) and experience the utmost kindness and hospitality from the gallant commander, reaching the outer roads by 9 p.m., and coming up to the mole by 8 next morning. We are happy to say the arduous labors were carried out without any persons being hurt by machinery or otherwise, but Dr. Bishop of the gunboat had his travelling-bag ready packed with instrument, lint etc., in case his services should be required. Mr. Oldham has his foot scratched with the cable, in landing the end at Point Lara, but it is nothing of importance. The Castor was to proceed on Tuesday to pick up the buoys and examine the “kink” in the cable already spoken of; if necessary the “kink” will be cut out and the cable spliced. She will then have to tow the ship down to Montevideo, where it is the intention to shell her. Mr. Felstead remains three months here, till the expiration of the contractor’s term for safe delivery, but Mr. Oldham staff have a contract to remain here five years. Before concluding this hastily written diary, in which no doubt many things are not treated of with professional accuracy, we think it right to make honorable mention of the untiring labor of the engineers and all others employed, and while congratulating ourself on having had the pleasure of witnessing so great an undertaking, we hope the River Plate Telegraph will prove no less remunerative to the company than useful to the sister cities of La Plata. The line will be fully opened in less than 30 days. The cable party has at last arrived. The whole expedition, although ultimately crowned with success, was a chapter of accidents. We are happy, however, that at last the great work is finished, and in a few days we hope to get news, via Punta Lara, from Montevideo. Ombú: Herbaceous tree of the Phytolacca dioica family. Can reach a height of 10 meters. The author of the chronicles uses the old (British) spelling of Buenos Aires (Buenos Ayres).